Renewable electric power production could reduce highway maintenance and operating costs and provide backup for critical systems during power outages. 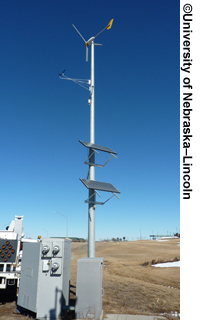 Using the public right-of-way and roadway infrastructure as a source for energy production, storage, and distribution is the goal of “A Roadway Wind/Solar Hybrid Power Generation and Distribution System: Towards Energy–Plus Roadways,” a Federal Highway Administration (FHWA) Exploratory Advanced Research (EAR) Program study awarded to the University of Nebraska–Lincoln. This project aims to develop an intelligent power system that can provide cost-effective, highly efficient, and reliable renewable electric power production, storage, and distribution. The Roadway Wind/Solar Hybrid Power Generation and Distribution System (RHPS) under development will lead to energy–plus roadways—where annual energy consumption is less than production—that could dramatically change the role of the public-right-of-way from an energy consumer to an energy producer. The RHPS represents a significant advance in the state of the art of renewable energy and production, storage, and distribution technology. 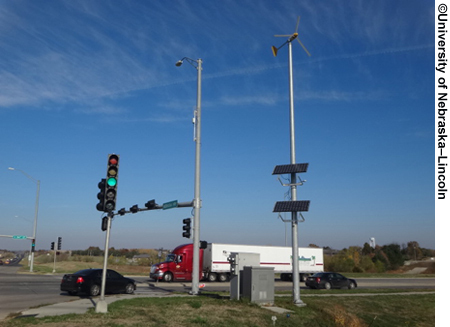 At the core of the system is an energy–plus traffic signal containing a wind and solar hybrid power system, as shown in Figure 1. Each signal will feature a wind-turbine generator and solar panels to generate power for onward distribution through the electric power grid. Due to the intermittent and uncontrollable nature of wind and solar resources, historical data will be studied at potential locations to determine the type and size of turbine and panels required for optimal performance. These signals will be connected to the existing utility distribution grids in close proximity to form a small power grid, known as a microgrid. A power-management system will be developed to manage production, storage, distribution, and consumption of energy based on demand within the grid using existing roadway communication and networking infrastructure. Each signal will be controlled by a local power management controller and it will operate as a smart local unit as it interacts with other signals. The microgrid will in turn operate as a smart entity within the wider utility distribution grid. The RHPS system builds on current practice in several ways. It offers a lower footprint than any previous effort and will be specifically developed for urban and suburban load centers, where the electric power will be used locally and not require additional investments in power distribution systems. The system will provide more continuous power generation by using wind and solar power to supplement each other. It will also provide more economically efficient electric power production and implement several significant technological advancements in the areas of renewable energy production and distribution. Unlike previous efforts, the RHPS system is also able to utilize existing maintenance resources for traffic signals. This project is expected to have several positive impacts. It could significantly reduce the overall power needed to operate and maintain roadway systems and help create a more efficient network. It will offer a source of backup power for the transportation system, reducing the risk of blackouts. By utilizing existing infrastructure to produce and distribute power, and control the microgrids, the system reduces investment in new infrastructure. The smart grids are also expected to have significant impact on the development of next-generation smart electric power grids. Demonstration of the transformative technology proposed in this research could eventually promote further opportunities for interdisciplinary research that connects smart grids and roadway. The system will be extensively tested and refined through modeling and simulation studies and a prototype will be constructed in University of Nebraska–Lincoln's electric power and energy systems laboratory. Traffic simulation software will be used to assess the impact on efficiency, operational costs, and driver behavior. Figure 1. The renewable infrastructure in place. For more information on this EAR Program project, contact Eric Weaver, FHWA Office of Infrastructure Research and Development, at 202–493–3153 (email: eric.weaver@dot.gov).